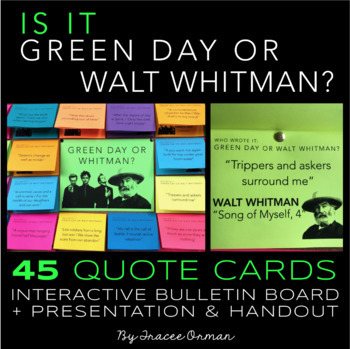 Who wrote it: rockers Green Day or poet Walt Whitman? 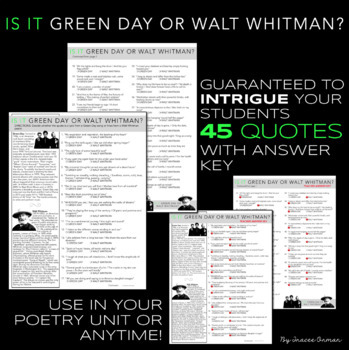 Your students will have so much fun trying to decide whether the quote is from a Whitman poem or lyrics from a Green Day song! 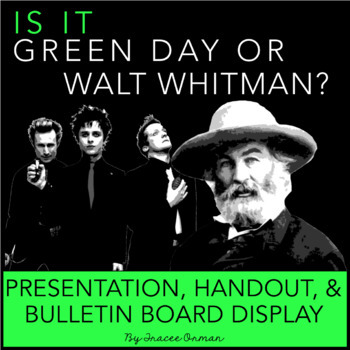 You can use the interactive bulletin board display OR the student handout and presentation as an anticipatory set to ignite excitement and appreciation for poetry. 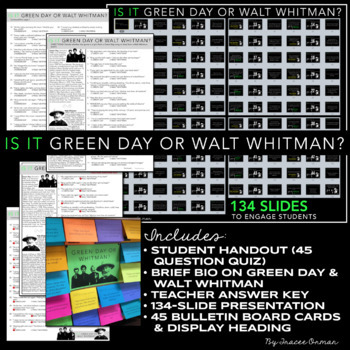 The zipped bundle includes a 46-page PDF for the interactive bulletin board (45 quote cards + one heading page), a 2-page PDF student handout (45-question "quiz"), a 2-page teacher answer key, and a 134-slide presentation (PDF format - NOT editable). The presentation and the interactive bulletin board both include the answers with details about the poem or song that is quoted. As a bonus, the handout includes a brief bio about both authors. It's a great way for your students to have a POSITIVE attitude about poetry. It also helps them see that the lines of poems are very much like song lyrics, which helps students to understand the meaning. This resource is not affiliated or endorsed by the members of Green Day, its producers or label, or any of its affiliates. Lines quoted under the proper guidelines for copyright usage.